PURE ORGANIC ARGAN OIL! This is one beauty skincare oil I have been searching for since years because it's all All in One Super Oil for hair and skin problems. Be it dry skin, hair, acne, pimples, dry rough ends or cuticles, this single product ARGAN OIL will take care of everything. You name the problem and here comes the solution, may be because it's a great source of Vitamin E, many more times the regular oils . This is the reason I was in search of this Wonderful beauty Skincare oil and finally by the grace of God (yes I can't thank enough when I get long desired product that too so easily since it's for the PR), I'm able to get one Olean Moroccan 100% Pure Organic Cold Pressed Argan Oil in India, you too can buy it online easily. Though it's a PR product but I'm totally loving it and the entire review is genuine based on my personnel experience. 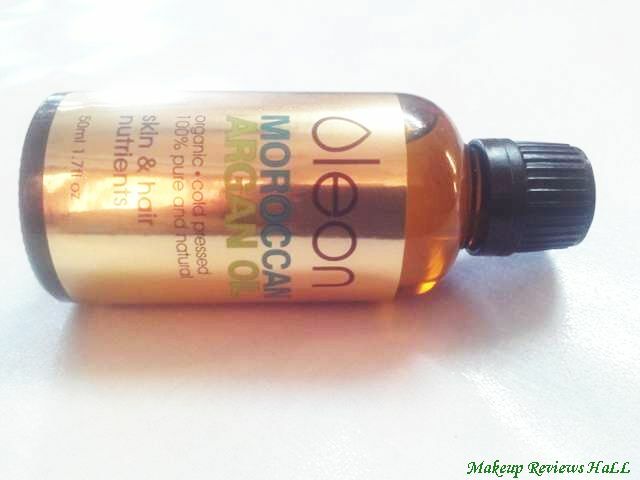 Let me give you the beautiful elegant look of this pure organic Olean Moroccan Argan Oil. Organic, Cold Pressed 100% Pure & Natural, Skin & Hair Nutrients. Organic Aryan Oil is rich in vitamin E essential fatty acids and protective antioxidants. Argan Oil helps nourish your skin and hair naturally while assisting in free radical protection. For soft skin and hair apply oil to the desired area as necessary. Daily face and body moisturizer. PRICE - Rs 1700/- for 50 ml. This oil comes in a beautiful glass bottle which looks very royal from a very high end brand. I am pretty sure everyone would be impressed by the beautiful solid elegant dark glass bottle of this Argan Oil. The bottle is very pleasant to look at but it's not very convenient to use. This comes with a somewhat different kind of a dropper which does not release the oil that effortlessly the way it should. But somehow one can get it use to it with a little bit piercing and tilting. Recommended - How Frequently Should You Oil Hair. 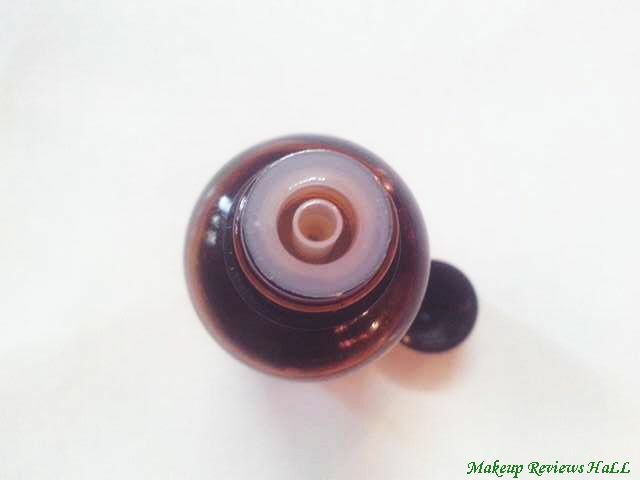 The oil is transparent with a slight yellow touch and smells really gentle but the fragrance is hardly noticeable until you poke your nose right into it. It's little thicker compared to regular coconut oil but need to be used very less like 1-2 drops mixed with water or any suitable moisturizer. I have acne prone dry skin and its extremely difficult for me to find a right product which along with soothing my acne nourishes my dry skin without aggravating my acne and pimples. 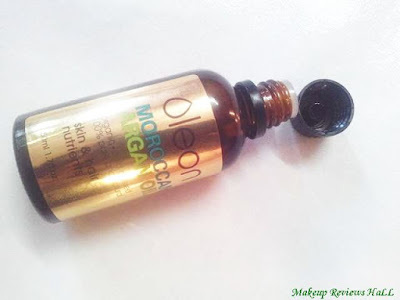 Very few products till date have been able to perform so good in such unique skin type like mine and this OLEAN MOROCCAN PURE ARGAN OIL has shown excellent results in this context. In the starting I used this oil only at night before sleeping applying it on a clean dry face followed with my regular oil free moisturizer for acne prone skin. Within about a week I saw improvement in my skin tone and texture with less acne and zits. Since then, I started using this oil in the morning as well before my regular makeup and skincare regimen and I'm extremely happy with the results, no dryness, no acne, pimples but just clean clear flawless skin with a subtle glow. I haven't use this much on my hair as an hair oil but I do use this as a leave in hair conditioner mixing it with water and it soothes my rough tangled dry ends. 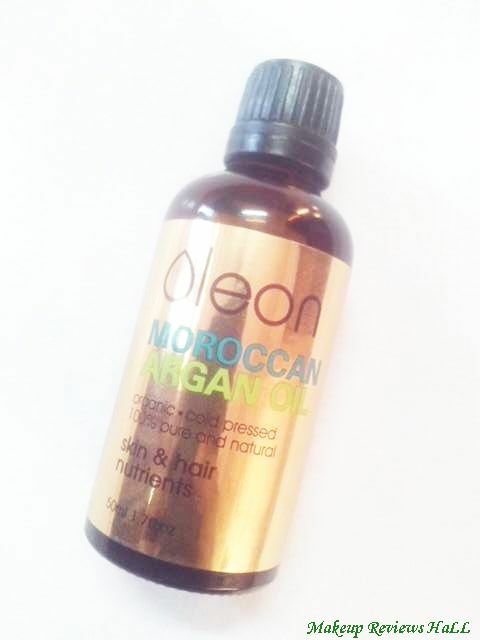 I'm thinking to make my own leave in conditioner using this pure Olean Moroccan Argan oil. I hope this review definitely helps and I'm sure most of the people would be benefited with the use of this amazing beauty oil since it's equally good for all skin types, be it dry skin, oily skin or normal skin. I haven't tried this oil for hair growth, but I guess this would be great for that too. It not only gets you rid of skin problems but also adds a natural glow to your hair and skin. What's more it's easily available online in India now at Flipkart here. Though it seems to be expensive but it's used in very less quantity so would definitely lasts long giving you amazing results. All in one beauty skin care oil. Perfect to be used on both hair and skin. Great for oily, dry and normal skin as well. Helps in soothing acne prone skin. Can be used as a face and hair moisturizer. Perfect to be used as a leave in hair conditioner. Great source of vitamin E.
Adds glow to face on regular skin. The bottle not so convenient because of somewhat different dropper. Glass bottle, not travel friendly to carry. Little expensive but truly worth the cost. At Arganeco we are committed to the future of the world of natural beauty. Guided by timeless values, respect to nature and absolute fairness in trading, constantly combining innovation authenticity and harmony to offer you the beauty you desire at affordable price. Provide products like Anti wrinkle serum, Anti Aging Serum, Intensive Repair Hair Mask, Moroccan Argan Oil, Argan Moroccan oil, Moroccan Oil for Hair and Argan Oil for Skin.